1570: Map of Europe in the shape of a queen. Allegorical map of the Baltic Sea in the form of Charon, the ferryman of Hades, 1701. America as the land of plenty, 1782. Britannia, hand-colored and engraved caricature map of Britain in the guise of an old woman seated on a sea creature, 1791. Comic map of the seat of war, 1854. Europe's comic map dedicated to the youth, 1867. 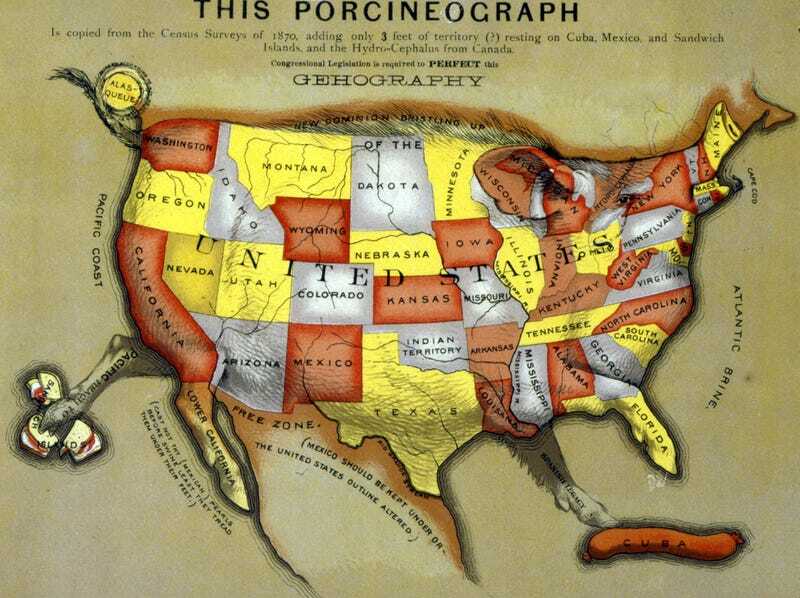 The Porcineograph, 1876, a map of the United States in the shape of a pig, surrounded by pigs representing the different states, with notations of state foods. Serio-comic war map for the year 1877. Animal Europe: comic physiology of Europe, 1882. Map of Europe in 1887. 1888: Illustrated political chart of American politics and the Tapeworm Party, showing James G. Blaine as the head of a tapeworm made up of various government scandals over a map of the United States. Japanese allegorical map representing the Far East, c1900. The Great European War, from A Humorous Atlas of the World (Japan 1914). Human map of the U.S.A., c1925. A map of the fortified country of man’s heart. Source: Glamour magazine, 1948. april.